Nicholas Carlisle (1771-1847) was, for over 40 years, one of the Secretaries of the Society of Antiquaries. He wrote to around 1400 schools enclosing a set of questions: 1. When and by whom, was this School founded? 2. What was the original Endowment, and what is the present amount of it? 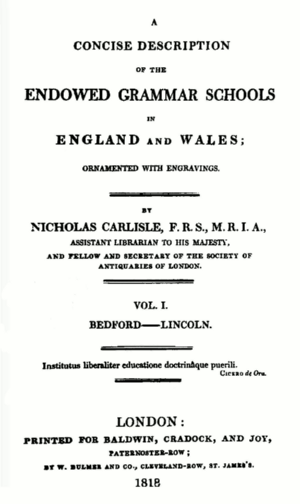 ...  and from the replies he assembled his A Concise Description of the Endowed Grammar Schools in England and Wales which was published in 1818. THE GRAMMAR SCHOOL at BOSBURY is supposed to have been founded by Sir ROWLAND MORTON who is said to have possessed “The Grange Estate” in this Parish, but at what period has not been ascertained; though it must have been prior to the reign of Queen ELIZABETH, as Her Majesty endowed the School with £8..4..2.. per annum, which is charged upon the Manor of Wormbridge, in the County of Hereford, and is now paid by The Kings Receiver of FeeFarm Rents to the Master. Sir Rowland Morton is also said to have built a neat stone-roofed Chapel at the South Aisle of the Church, adjoining the Chancel, where his Coat of Arms appears upon the inside of the roof in different places. The present Endowment consists of about Thirty-two acres of land, and Eight cottages, dispersed all over the Parish of Bosbury: The management of which, as well as the appointment of the Master, is vested in Twelve Trustees. About Twenty years since, the Trustees elected as Master of the School, an illiterate man who had never learned or knew a single word of the Latin or Greek languages; although the former Masters had always been Clergymen of the Church of England. Some of the Trustees who resided in the Parish, it is said, had got possession of considerable portions of the land contiguous to their own estates, at a very inferior rent. The Master’s house, which he now occupies, had not been in the possession of the Masters for the last Thirty years, until the present Gentleman came; the House, together with a valuable Orchard, and other lands about an acre and an half worth from £12. to £14. per annum, having been lett for the greater part of that time “to a near Relation of one of the Trustees at £3. per annum”.! while the Masters of the School were obliged to lodge where they could, some, at the distance of four miles. Upon these accounts, the late Vicar of Bosbury, and some of the Inhabitants of the Parish, laudably instituted a suit in Chancery against the Trustees, to compel them to elect a Clergyman and Grammar Master, and also to relinquish such lands as they had in their hands, and to lett them at their full value. The present Lord Chancellor has decreed, “that the said School is a Grammar School,” and thereupon the Master has been appointed, but the other points are not yet determined. All the boys of this Parish, as soon as they begin to learn the Latin language, are taught free of expense. Since the present Master was elected, in 1815, he has also most benevolently taken Ten boys whom he instructs in reading, writing, and arithmetic gratuitously, although he does not consider himself bound to do so. About ten or fifteen other boys are usually educated at this School. Children are admitted at about ten years of age, and there is no prescribed time of superannuation. The Master nominates. There is no particular form of Admission. The Eton Latin and Greek Grammars are used; and the system of Education is upon the Eton plan. In 1676, Richard Reed, Esq., of Lugwardine, founded an Exhibition of £4. per annum at Brasen-Nose College, Oxford, for the maintenance of one Scholar of his Posterity, or for a Scholar from the School of Bosbury, or from the Free School of the City of Hereford, being natives of the County of Hereford. The present Master is, The Revd. Thomas Lewes, whose Salary is from Sixty to Seventy pounds per annum, but capable of being raised to £120. or more. This Gentleman takes Boarders; his terms being about £25. a year for each Pupil. Many very respectable Characters have received their Instruction at this School. The late Thomas Loggen, Esq., of Basinghall Street, London, an eminent Solicitor, was educated here. Mr. John Meakins, a native of Bosbury, and educated at this School, by his Will, dated the 1st of April, 1811, left £100. Sterling to the Minister and Church-wardens of Bosbury, to be invested in one of the Government Funds in their names, and to receive the interest and dividends for ever, to be applied as follows,10s. 6d. annually to each of such boys in Bosbury School, as they shall consider the best Writer,the best Arithmetician,the best Grammarian,and the best Composer in prose and verse,and the residue thereof to such as they shall consider the most industrious Poor of the said Parish, and such as they shall find most constant in their attendance on Divine Worship.